A week after the McLaren 1-2 in Austria Mika Hakkinen and David Coulthard lined up 1-2 on the grid at Hockenheim, the pair having lapped half a second faster than the Williams of Jacques Villeneuve. The Ferrari team was in trouble, however, with Eddie Irvine sixth on the grid and Michael Schumacher ninth, having wasted a lot of time with a long-wheelbase Ferrari. The wheelbase is the distance between the centres of the front and rear wheels and this can be varied from the standard dimensions to improve the handling qualities of the car. On this occasion the changes didn't and Schumacher decided to go back to his normal car only to go off in practice on Saturday morning. In the second part of the session he blew the engine and so had made almost no laps before qualifying. In the race Hakkinen and Coulthard got away well and led from start to finish. In the closing stages Hakkinen's car began throwing out large amounts of oil and slowed with a loss of horsepower but Coulthard slowed as well. Villeneuve did not make a good start and dropped behind the Jordans of Ralf Schumacher and Damon Hill. During the first lap Jacques was able to repass Hill, leaving Damon to fight off the two Ferraris. Irvine made life easier for Schumacher when he made a mistake and went off. In the early laps Ralf Schumacher was able to keep pace with the McLarens but he was running with a light fuel load and pitted early. Villeneuve moved up to third as a result and proved to be able to keep pace with the McLarens. With all the other major runners on one-stop strategies the order remained unchanged at the front although Coulthard was much closer to Hakkinen after his stop. Villeneuve finished third with Hill fourth, scoring his first points of the season. Michael Schumacher survived to finish fifth and his brother Ralf ended the day sixth. 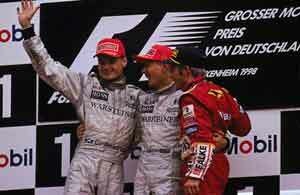 The result increased Hakkinen's lead in the World Championship to 16 points and Michael Schumacher's task looked harder than ever with only five races to run.